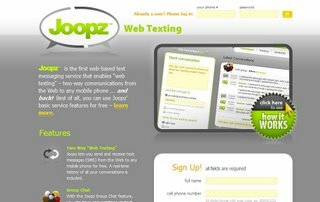 Joopz is a highly-innovative web-based text messaging solution from MobileSphere. It allows users to send text messages (SMS) from the Web to both individuals and groups, while enabling recipients to respond directly to the originating PC or Mac. In fact, Joopz web texts can be sent from any web-enabled device worldwide to any U.S. or Canadian mobile phone.